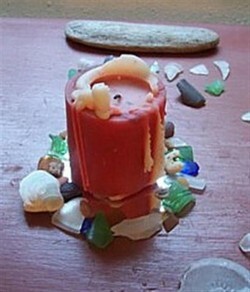 Ways to use your collection of sea glass! Easy to do, yet unique and attractive. Photos and steps to create a beach glass frame. 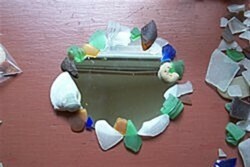 A sea glass picture frame or mirror is a nice and fairly simple way to use your sea glass collection. Although I will be talking about creating a sea glass frame for a mirror, the same steps apply to a photo frame. Also, this is a project that doesn't require the special equipment necessary to know how to drill sea glass. Find a mosaic-ready mirror (or flat wood picture frame) you like and glue or grout your pieces of sea glass onto it around the edge of the mirror to give it a border. Depending on your preference, you could also glue on shells, sand (craft sand will do if you don't have access to a beach), pebbles, driftwood, or other attractive things you've found at the beach. 1. First, lay your mirror out on a table. 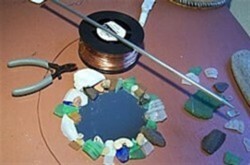 Before gluing or grouting, decide how you want to arrange the sea glass and shells and whatever else you're using. 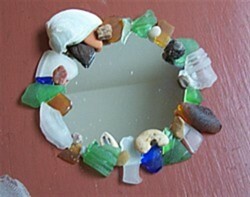 Move things around until you find a sea glass mirror layout that you are happy with. 2. Next, take your super glue, epoxy glue, or silicone adhesive and glue each piece onto the mirror. After you have glued everything onto the mirror, you can then go back and fill in the empty spaces with small shells, beach pebbles, or sand, depending on the effect you want. At this point, you could add your picture-hanging hardware and be finished. Or you could go on to the next step. Wire cutters and a knitting needle as well as #18 gauge copper wire are pictured. Take wire (copper wire is nice and not expensive) and wire wrap the mirror, being sure to not cross the center of the mirror. 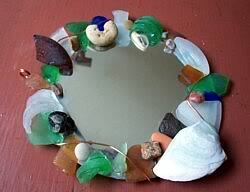 You can do a simple wrap as shown in the photo of the back of the sea glass mirror here, or use your creativity to make the wrap more artistic. 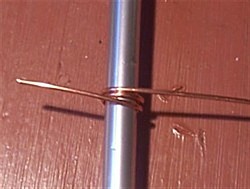 Finish off the wrap with a loop made as shown in this closeup. When you are done, the mirror should look similar to this. 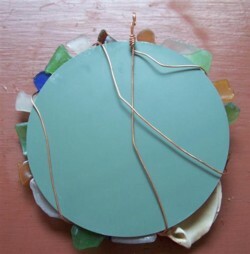 Follow steps 1 and 2 for creating sea glass photo frames. An additional idea would be to use smaller mirrors and instead of creating it as a mirror to be hung on the wall, place a candle on top of it and use as a centerpiece or gift. Have you tried one of these projects or another project with sea glass? Share your work with us! Have you made one of these Sea Glass Crafts projects or one like it? We'd love for you to show off all of your hard work! It doesn't matter if it is very basic or more complicated, we love to see them all. Note - To upload a photo, it should be less than 1000 pixels wide. There are so many different possibilities with these projects, and we'd love to see what you've come up with. Simply use this form to share your project with us. And please...share a photo of your work!